× Two-Per-Day Capsules has successfully been added to the list . The requested item 02214 is obsolete and has been replaced. The new item is 02314. You will be Adding Two-Per-Day Capsules to the list . Our Two Per Day formula gives you more of the essential vitamins, minerals, and other nutrients your body needs. This is important because Recommended Dietary Allowances (or RDAs) provide only the minimal doses necessary to avoid deficiency. But in order to achieve optimal health and well-being, you need the ideal dose of high-quality vitamins and minerals every day. *Formula compared to Centrum® Silver® Adults 50+. Our soy-free Two-Per-Day Capsules contain the bioactive form of the B-vitamin folate, 5-MTHF; zinc citrate; the mixed tocopherol form of vitamin E, and more. Get the most out of your multivitamin with Life Extension Two-Per-Day Capsules. 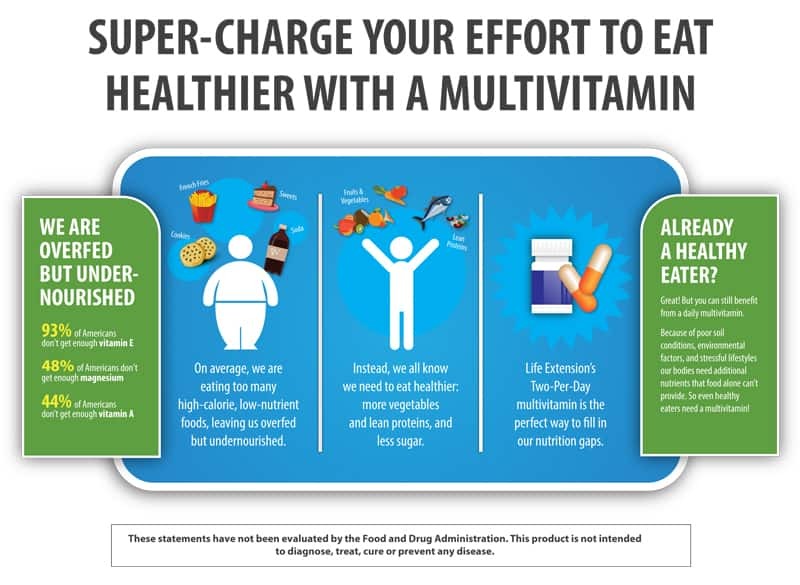 Huge numbers of Americans take a multivitamin, but the potencies of the individual nutrients are usually so trivial that any health benefit is minimal. And that makes the ultra-low cost of our Two-Per-Day formula one of the great bargains in the dietary supplement marketplace. Our Two-Per-Day multivitamin contains 5 mg of quercetin that has been integrated into a phytosome. A phytosome is a phospholipid sphere that encases a botanical compound, aiding in its absorption and making it more bioavailable: this quercetin is up to 50 times more bioavailable than standard quercetin. Quercetin supports cellular health, endothelial health, healthy immune function, and more. We all know vitamin D supports bone health. But vitamin D also promotes healthy cell division, supports immune system health, and more.2, 3 Because of widespread vitamin D deficiency, nutritional scientists are calling for an increased vitamin D intake: 1,000 IU per day and higher. Our Two-Per-Day multivitamin delivers 2,000 IU of vitamin D3 with every serving. Vitamin C is famously associated with immune system health, an effect that may result from its ability to scavenge free radicals and protect against oxidative stress, as well its stimulation of the production and function of white blood cells.4-6 Additionally, vitamin C is vital to collagen formation, the connective tissue found throughout healthy arterial walls, skin, bones, and teeth.5 Our Two-Per-Day formula delivers 470 mg of vitamin C per serving. Your body needs B vitamins to release energy stored in carbohydrates, fats, and proteins — energy your cells use to carry out their daily functions. But there’s more than one “vitamin B.” And because they are metabolically codependent, B vitamins work together to keep you healthy. That’s why our formula contains readily metabolized forms of vitamin B1, riboflavin (B2), vitamin B12, vitamin B6, and more. For optimal health benefits, mixed vitamin E tocopherols are some of the most valuable forms of vitamin E. For biomarkers of oxidative stress and inhibiting inflammatory factors, evidence shows that combining alpha- and gamma-tocopherols is better than taking either nutrient alone.9 Our formula provides more than 80 mg of mixed alpha, beta, delta, and gamma tocopherols. A multivitamin is not complete without the minerals and other nutrients essential to healthy living. Our Two-Per-Day formula provides 10 times more biotin and twice as much zinc as Centrum® Silver® Adults 50+. Our formula also delivers 100 mg of magnesium and 150 mcg of iodine, as well as trace minerals like manganese and boron. Selenium — Selenium supports heart and brain health, promotes a healthy inflammatory and immune response, helps quench free radical activity.13, 14 Our-Two-Per Day formula has three unique forms of selenium (200 mcg total): SelenoExcell®, Se-methyl L-selenocysteine, and sodium selenite, each form acting along a different biological pathway. Apigenin — This powerful botanical bioflavonoid is found in many fruits and vegetables.15 Apigenin helps boost the body’s natural cellular defenses. Marigold extract — Standardized for both trans-lutein and trans-zeaxanthin, the marigold extract in our Two-Per-Day formula promotes ocular health and helps inhibit oxidative stress. Everyone should be taking a daily multivitamin: there’s no simpler way to ensure your body is getting the essential vitamins, minerals, and nutrients you need to stay healthy and live better. But not all multivitamins are created equal — so choose Life Extension Two-Per-Day Capsules. Int J Diab Dev Ctries. 2010 30(3): 153-161. Aging Dis. 2017 May; 8(3): 346-353. Ann N Y Acad Sci. 2013 1287(1): 45-58. Adv Nutr. 2014 Jan 1; 5(1): 16-8. Br J Pharmacol. 2004 Mar; 141(5): 825-30. The Primary Care Companion for CNS Disorders. 2013 08/29; 15(4): PCC.13m01520. Free Radic Biol Med. 2008 Mar 15; 44(6): 1203-8. Inflamm Res. 2017 Nov; 66(11): 947-959. Free Radic Biol Med. 1998 Apr; 24(6): 1023-39. J Inorg Biochem. 2015 Dec; 153(1): 1-12. Pharm Res. 2010 Jun; 27(6): 962-78. Other ingredients: capsule (hydroxypropyl methylcellulose/chlorophyllin), starch, maltodextrin, vegetable stearate, dicalcium phosphate, silica, microcrystalline cellulose. Lycored Lycopene™ is a registered trademark of Lycored; Orange, New Jersey. SelenoExcell® is a registered trademark of Cypress Systems Inc.
L-OptiZinc ® and logo are trademarks of Lonza or its affiliates. Crominex® 3+, Capros® and PrimaVie® are registered trademarks of Natreon, Inc. Individuals consuming more than 2,000 IU/day of vitamin D (from diet and supplements) should periodically obtain a serum 25-hydroxy vitamin D measurement. Vitamin D supplementation is not recommended for individuals with high blood calcium levels.